This week, our picture is news-related: it comes from the Gulf Coast, an area ravaged by Hurricane Katrina just days ago. We don't get hurricanes, but we do get serious storms and earthquakes. 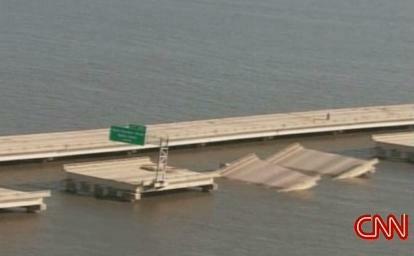 What you're looking at is the Interstate 10 Twin Span heading out of New Orleans to Slidell. That is eastbound, if you're leaving New Orleans for the Mississippi Gulf Coast. That is the main artery coming east into the city. It's definitely been cut up. The Twin Span, or Causeway, is the vital link across Lake Pontchartrain. You can see from the picture above that it was shredded by Hurricane Katrina. It's eerily similar to our own State Route 520 bridge, which connects the City of Seattle to the Eastside of Lake Washington. The 520 bridge is a heavily used artery that supports the majority of cross-lake traffic north of downtown Seattle at approximately 110,000 vehicles per day. An extra special bonus feature this week: we've included some questions and answers from WSDOT about the new funding package which debunks myths such as the claim that Washington now has the highest gas tax in the nation (it doesn't). Is there a list of projects in the new funding package? Yes. The legislature funded 274 projects to be constructed over a 16year period. The project list is available at: Statewide Projects Funded By County). Are these projects actually going to get built? Of the 274 projects, 241 are expected to be completed with the funds from the 2005 gas tax package. That means designed, constructed and in use by the public. Some of the others have, or may need, additional funds from local or other sources, including possible regional revenue programs. Does WSDOT complete projects on time and on budget? Yes. WSDOT completed the first 13 projects on the list specified for the 2003 nickel gas at a cost of $2 million less than their estimated total cost of about $43 million. Eight projects were constructed ahead of schedule, four were on time and one was late. Why does WSDOT continue to build HOV lanes? What about the needs of ordinary single-occupancy vehicle drivers? HOV lanes are a small but important part of our highway system. Of the 240 new miles of road built or currently under construction since 2001, about 37 miles are HOV lanes in the Central Puget Sound area. The Central Puget Sound “core” HOV lane system is designed to assure fast and reliable performance by transit, vanpools and carpools, which makes the system more efficient for everyone. Experience shows that all lanes move faster when new HOV lanes open. A notorious bottleneck disappeared on I-5 at Southcenter Hill when the new lane opened in 2003. HOV projects often also improve roadways that benefit traffic of all kinds, in all lanes. For example, adding HOV lanes on the Tacoma Narrows Bridge will allow the general purpose lanes to be reconfigured with wider lanes and shoulders. All traffic will move better -- backups from disabled vehicles, and the accidents that follow, will be reduced. How many new lane miles has WSDOT built recently? 165 are highway lane miles (including 37 HOV lane miles). 25 miles of new turn and acceleration lanes, on and off ramps or similar work. A “lane mile” is one mile of highway, regardless of the number of travel lanes. How much does it cost per mile to build a new lane of highway? It depends on where you are, and factors such as land costs, people or businesses to relocate, environmental needs arising from construction such as noise walls for neighbors and storm water cleaning for streams and wetlands. It also depends on the elements in the project - are we just building a road, or are new bridges or interchanges also included? SR 18 widening in rural King County - about $24.5 million per mile. US 12 widening south of Tri Cities - about $3.7 million per mile. I-5 widening in Vancouver – about $20.2 million per mile. I-90 truck climbing lanes east of Cle Elum and at Vantage – about $1 million per mile. I-5 HOV lanes from Tukwila to Fife – about $7 million per mile. These costs are for construction only and do not include costs for engineering and design and for a widely-varying factor, land acquisition costs. How much of the state gas tax goes to monorail? To light rail in Seattle? None. Gas taxes are only to be spent on highway projects, as guaranteed in the 18th Amendment of Washington's constitution. Is Washington's gas tax the highest in the country? No. After the three cent increase that went into effect on July 1, we are tied for 8th with Rhode Island. Ahead of us are Hawaii, Illinois, California, New York, Nevada, Wisconsin and Indiana. Oregon and Montana are in the 27 –28 cent range, ranking 14th and 16th on the table. Of the 31 cents collected, 11½ cents goes to cities and counties for streets and roads. The remaining 19½ cents is used to maintain and improve the freeways, state highways, bridges and ferry system. How much do I pay in gas taxes? This year about $169 in state gas tax and another $100 in federal gas tax. That assumes you drive 12,000 miles a year and get 22 mpg, which is average for drivers in our state. How much do the increases in the gas tax voted in 2005 cost me as a typical driver? Seattle Times, others reprint open letter from Times-Picayune!